3 Months 10 Beers, Kocour IPA Samurai – It’s Halloween…Will Dani Get Tricked or Have a Treat? My wife and I are on a quest to find her 10 beers over the next 3 months that she can enjoy! We have found very few beers that she has enjoyed. Over the last couple of weeks, we haven’t posted any reviews, mostly because I’ve struck out a number of times. Not because they were bad beers, in fact I really enjoyed all of them, but they didn’t appeal to Dani. Along with finding some wonderful beers that Dani likes, we want to keep these sessions positive. Ok, so I know it’s been a while since I’ve weighed in on a beer so I will take my FAVORITE holiday to try something new. Just to recap I believe there are 6 beers so far that I liked so Peter only needs to find 4 more in order to reach the goal of this experiment. I have to admit that while I recommended this experiment as a way for me not to sit aimlessly at a bar with my husband I really come to appreciate and (dare I say it ) love beer a little more. Okay, so on to this next one. 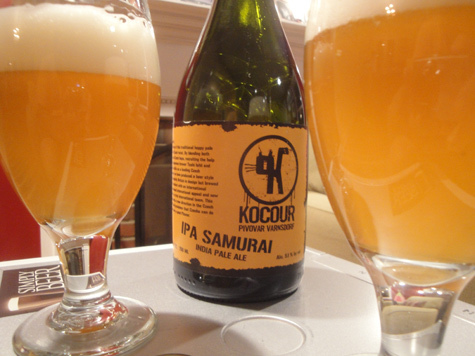 Peter has served me a Kocour IPA Samuari this evening. It’s really light and crisp (2 things we now have learned is my preference). In other words a TOTAL treat and not a trick at all. Okay, we are up to 7 that I would drink. All we need is 8,9 and 10! If you have recommendations let us know! The IPA Samurai was one I actually thought Dani would like after reading the description of the beer. it was basically pilsner like dryness with Czech Saaz, Amarillo, and Simcoe hops. To me this read as a floral and dry beer and was it ever. It was dry, crisp, slightly tart, hoppy floral and grainy. Not only that it drank like a dream, so refreshing and tasty! What is really cool about this beer is the ownership that Kocour has taken of this beer, by calling it a Czech IPA. Do we have a 3rd style of IPA on the horizon? If we do and they are as good as this beer, I’m stoked! Check out the history behind this beer on BeerNews.org. I don’t know if you have access to Victory Beer, but thus far I have never had a Victory brew I didn’t fall in love with. Their Moonglow Weizenbock rocked my world the first time I had it. Maybe throw a few Victory’s at her and see what happens! Cheers to 8, 9 and 10 coming soon! Looking forward to trying this beer. Stevie and I will actually be going it He Said She style for her Ladies of Craft Beer site. The beer sounds wonderful on paper.